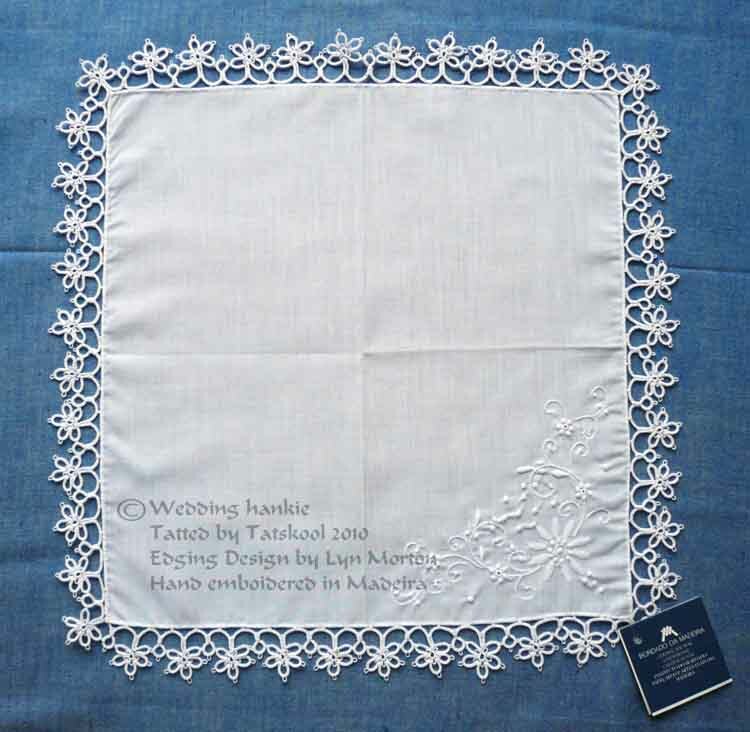 TATS A KOOL CHALLENGE: Wedding Stuff Part 3.The Finished Hankie! Can you imagine how difficult it is to give this away !! Do please excuse the number of photos I am going to show you!! I can't believe how beautiful this is. 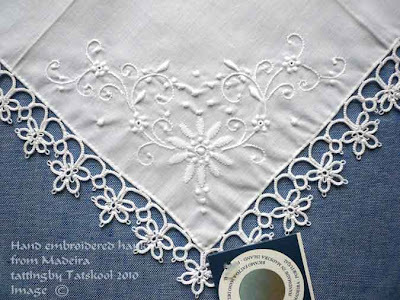 Madeiran hand embroidery is some of the best in the world. This reminds me so much of the embroidery that was done in Ireland at the time of the famine. Let's talk more about hankies next time. It's really wonderful! Surely this bride will treasure it as your gift and as an heirloom. The edging is such a perfect match to the embroidery. This is fantastic! I just tatted today for the first time, learning it from a book and Youtube. So this is way too complicated for me, but it is really lovely and motivating! It looks wonderful!!! The bride will love it!!! This is really beautiful, a real treasure! I'm sure the bride will love it. Very elegant indeed. I was trying to see whether you had stitched the edging on, or whether the hanky is spokestitched - can't quite work that out. Oh this is very lovely. Gee, if I talk Loyal into marrying me again; may I have one as a wedding gift. LOL It really is perfect. I love the embroidery, I do so love fancy stitching…mine own was very humble; but, I've always been fascinating and wanted to learn to do this sort of work. I'm never happy with the hankies available for adding tatted edgings. 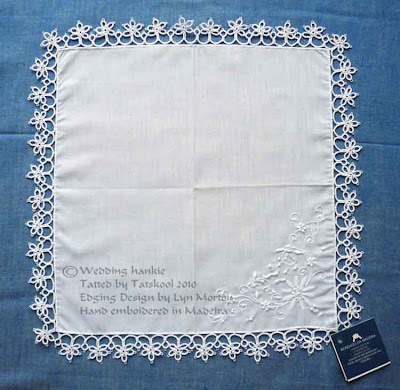 Doing edgings are such a lot of work (to do well) and use a lot of thread (it is amazing how much thread is used). We can't just buy linen yardage easily here (at least in NM) or I'd buy yarding and cut and hem my own hankies. What a lovley edging and the embroidery is exquisite. It will surely become and heirloom! Holy COW, that is incredibly, exceedingly, ridiculously GORGEOUS! 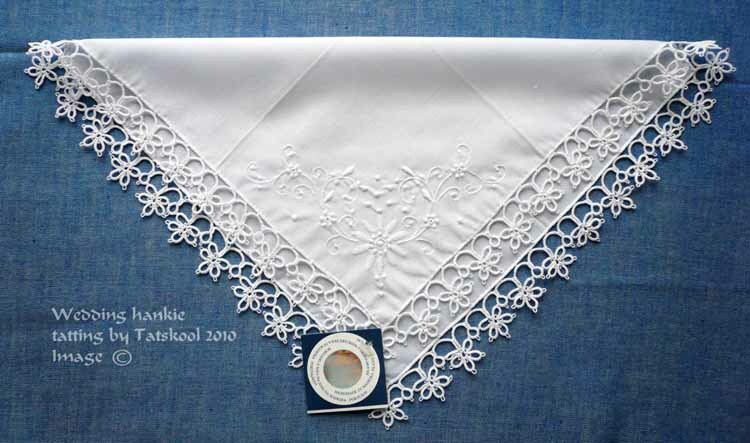 All that beautiful tatted lace, especially when the hankie is folded over like that. WOW! Yes, a true heirloom indeed. The pillow is exquisite, as well. How exciting! I hope all the wedding preparations go well and the day turns out perfectly. A warm congratulations to you and your son! I can't believe how perfect an edging design that is for that particular hankie! It is just gorgeous! She is going to cherish it! You chose a lovely pattern of tatting to add on. It just compliments the embroidery on the hankie. I'm so glad you showed us so many photos. It is such a treasure. 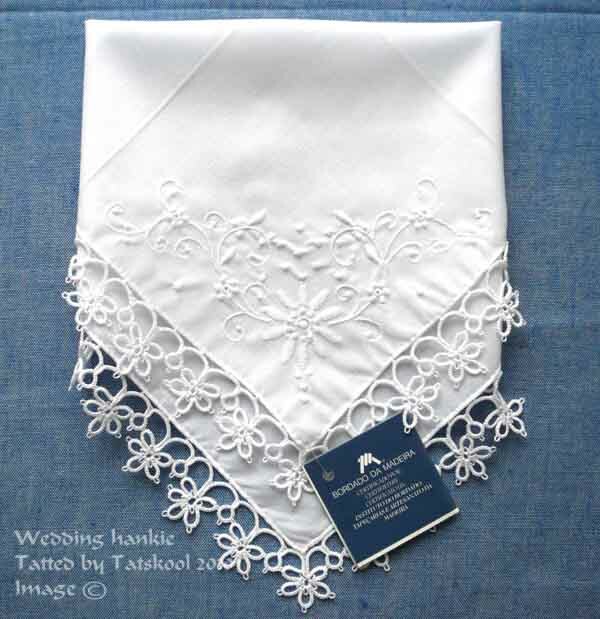 A wedding handkerchief THAT (how did Bella say it?) "incredibly, exceedingly, ridiculously GORGEOUS" needs more photos! Sorry, that is just me getting grabby -- it is truly, covetously, rapturously beautiful. A masterful bit of lace-making, indeed! Your soon-to-be daughter-in-law will cherish it forever. As a few have mentioned before me, the edging complements that embroidery perfectly! What a beautiful gift to give!